The other morning it was quite chilly when I brought my husband to work around 6:30 a.m. Like, 35 degrees or something. Even being someone who loves cold weather and hates the heat of summer, this was cold enough to require putting something on, even just the sweat jacket I usually wear. But even I knew that a sweat jacket would be just a little bit too light for that kind of early morning, when the frost was heavy on the dusky world outside, making everything appear like those old fashioned decorations with the fruit all covered with sparkly opaqueness. The kind in a bowl on your grandma’s table that you eyed and wanted to touch when she walked out of the room. But I’m a hockey girl. Everyone who knows me knows that. And I only have eyes for the Boston Bruins…..2011 Stanley Cup Champions. Though I love Zdeno Chara, and Tyler Seguin has been awesome this season….Tim Thomas is my man. He is an excellent goalie and has had many shutouts the past several games. 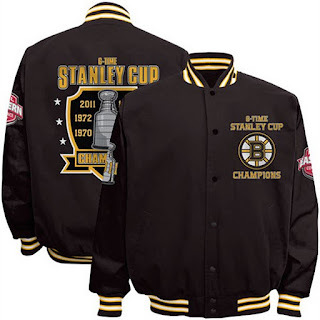 Lovely twill cotton, team logo on the front and Stanley Cup Champion patch on the back….my goodness. Be still my beating heart. Now, with that coat on in the winter, I’d be so stylin’! And someone wouldn’t have to worry about me getting too attached to his Patriots coat. Not to worry anyway….I think hockey is way better than football, and do not even attempt to explain football to me. It's a battle you will not win... and Tim Thomas has it all over Tom Brady.